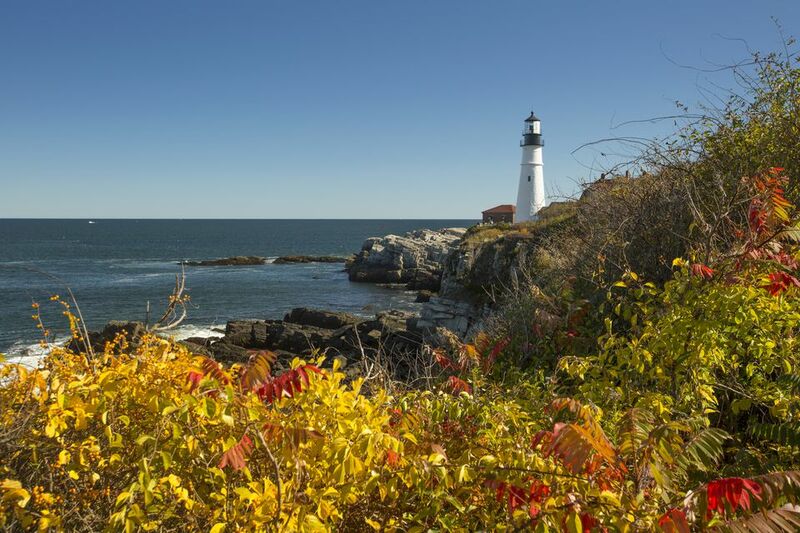 Freeport is a quick, 20-minute drive up Interstate-95 from Portland, Maine, but to get the best look at the scenery—especially during fall foliage season—try this scenic route instead. Mainer Debby Fowles shares detailed directions for driving from Portland to Freeport on picturesque back roads. Leaving Portland via Interstate 295 North, take the exit for Route 1 after crossing Tukey's Bridge (just past the B&M Bean Factory). Near Falmouth Foreside, veer right onto Route 88. Take time to admire the stately homes, the elegant old maples and oaks in their autumn finery and the glimpses of Casco Bay through the trees in Maine's wealthiest community. Just after the marina at Lower Falls Landing on the Royal River in Yarmouth (stop for a bite or a drink at Royal River Grill House if time allows), and after passing under the Interstate 95 overpass, take the first left up Marina Road. Bear left at the next intersection onto Main Street, where you'll pass several old white churches with steeples framed by the flaming colors of graceful old maple trees in the fall. After you see the North Yarmouth Academy, a college prep school established in 1814, on your left, turn right onto York Street, and merge onto Route 1. Just before the big Indian statue in South Freeport, turn right onto South Freeport Road and proceed to the Town Wharf off Main Street, where you can enjoy vibrant fall colors and spy on sea birds. Here, you can also feast on chowder, fried seafood, clamburgers and homemade desserts at Harraseeket Lunch and Lobster Company, where the lobster pound also cooks up fresh whole lobsters, crabs and clams. On your return, follow the signs to Winslow Memorial Park and Campground, South Freeport's fine sandy beach and shaded picnic spot. Return to Route 1 and continue on to Freeport, turning right at the light at the intersection near the Citgo station to reach the L.L. Bean Flagship Store on Main Street and factory outlets including favorites like Vineyard Vines, Patagonia, Calvin Klein and Gap. While Freeport, Maine, is best known for shopping, attractions worth visiting include the Desert of Maine (yes, there's a desert in Maine! ), Cold River Distillery (their vodka is made with Maine potatoes) and Wolfe's Neck Woods State Park (a scenic spot for birdwatching and hiking the Casco Bay Trail along the coast). Check Freeport USA's calendar of events, too, for concerts and other fun happenings in town. Compare Rates and Reviews for Hotels in Freeport, Maine, with TripAdvisor. Continue north on Route 1 and follow these directions to the picturesque island of Georgetown, Maine. Rockland, Maine, native Debby Fowles has written extensively about her home state and inspired hundreds of thousands of travelers to explore places dear to her heart, such as Popham Beach and Maine's top foliage spots.